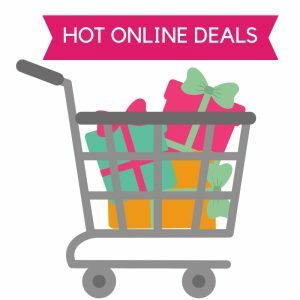 Cash is the ultimate last-minute gift, but giving it doesn’t have to be boring! Check out these creative ways to make giving cash as a gift more fun and engaging. 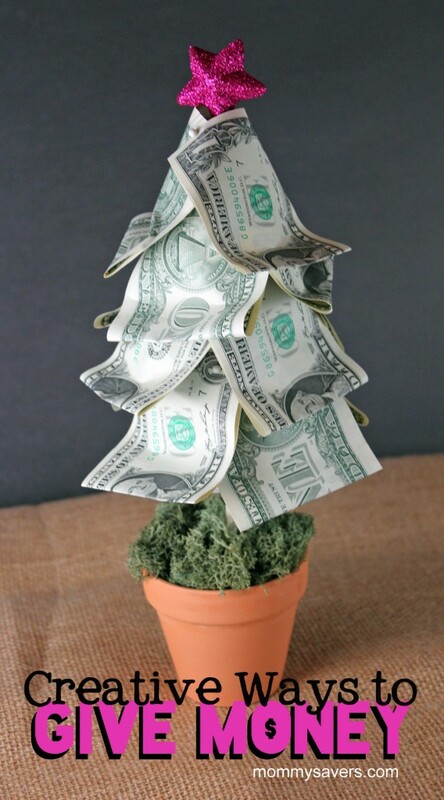 A “Money Tree” (pictured above) is a cute Christmas table decoration as well as a clever way to give cash as a gift. 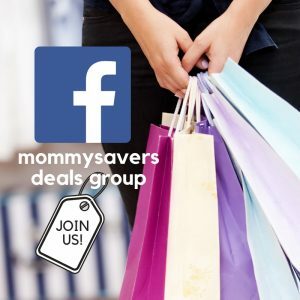 It’s pretty easy and takes less than 15 minutes! Start with a small terra cotta pot, some floral foam, a dowel stick and a styrofoam cone. Simply pin your dollar bills to the styrofoam to make the tree’s branches. Add a little moss at the base of the tree, and a star on top. It’s very festive! 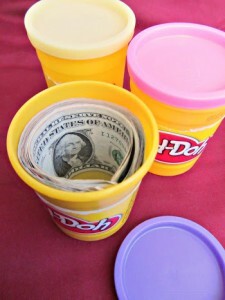 Reuse a Play-Doh container to hide money in and give it as a gift. This gift idea works really well as a stocking stuffer! Add a gift tag that says something like, “Here’s some ‘dough’ to play with this Christmas!” for a funny play on words. It’s such a cute way to give money. Wad up the money you’re giving as a gift and start wrapping rubber bands around it. Keep wrapping until you have a nice big ball of rubber bands! Then, wrap up the rubber band ball itself. This is a way to give money that will keep the recipient busy as well. A Box in a Box – NOT! Carefully open one or more walnuts, and remove the nut. Fold a bill and insert into the walnut shell. Glue the walnut shell closed. 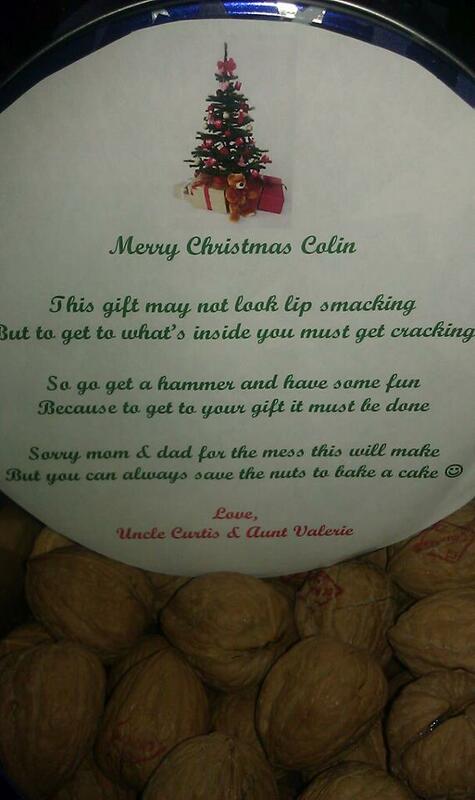 Mix the nuts with money up with regular walnuts and let the recipient crack them open to find the cash! Who doesn’t love cold hard cash? 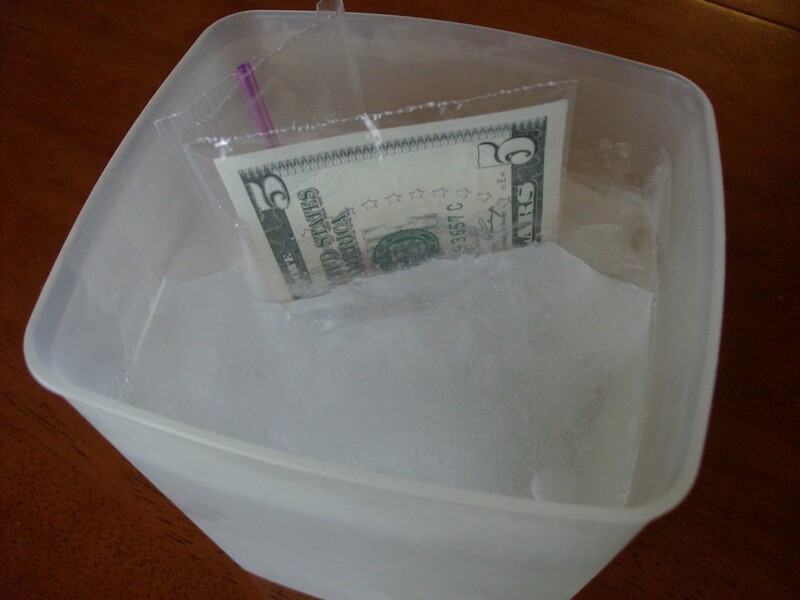 Place the cash in a plastic bag to keep it from getting wet. Put it in a container of water, and freeze it into a block of ice. When I gave this gift, I just left the ice block into the snow in the front yard and let the recipient find it. 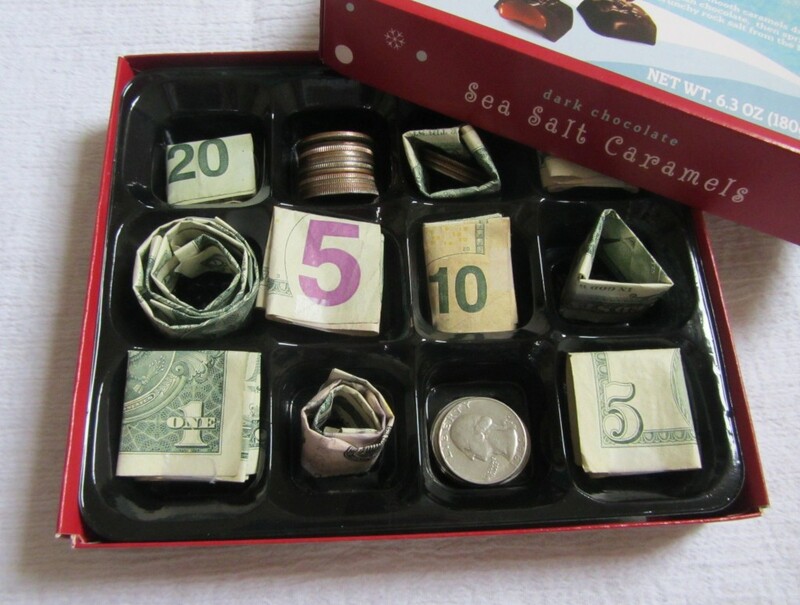 This creative way to give money is similar to the walnut gift idea above. 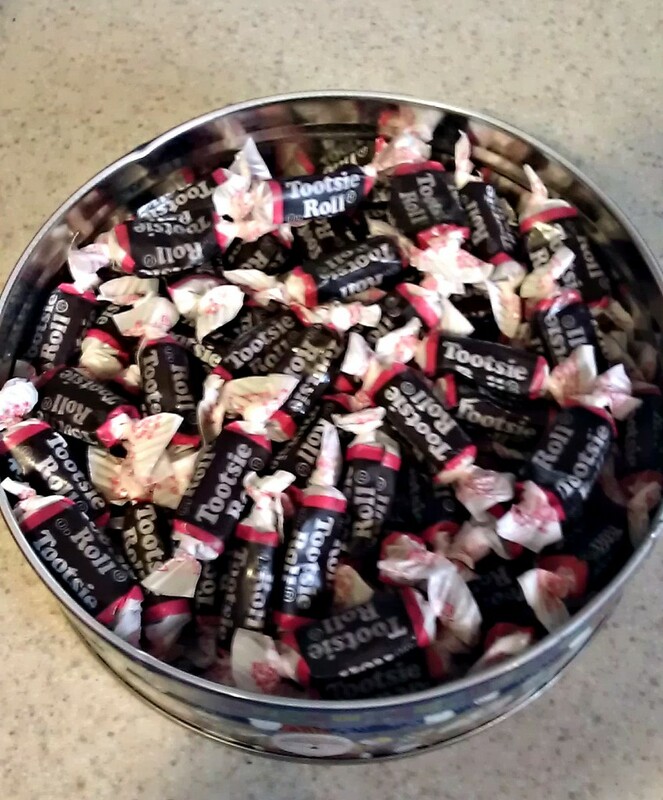 Tightly wrap one or more bills in tootsie roll wrappers and hide them among tons of real tootsie rolls. Unwrapping is part of the fun! Tightly roll the money, and tie it with ribbon. 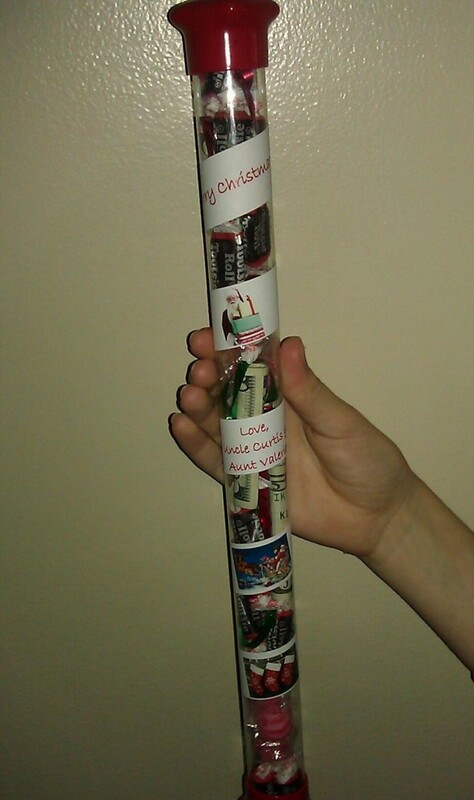 Fill an empty tube with the wrapped money and candy. Decorate as desired. This gift idea is also a great way to reuse those plastic candy-filled candy canes. I always knew there was a use for those! Give money by cleverly hiding it in a magazine! You’ll need two magazines with thick pages. Cut a picture from one magazine and glue it over the same picture on the identical page in the other magazine, with the money sandwiched in between. This one can be very tricky, so use it for older kids. 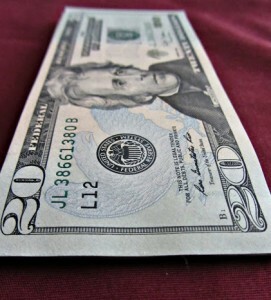 Roll up bills and bill-sized notes into a roll. On the last note, make a “pull here” tab. Put the roll of bills and notes in an old tissue box, or a box with a slit cut in it, with the tab sticking out. I rolled up the bills and pushed them into the fingers of gloves. He was disappointed that all he got were gloves and couldn’t understand why I insisted he try them on! I love all these ideas! Such fun! I have a nephew that placed a $50 gift certificate in a bag of popcorn as a gift for his sister. She was quite angry over receiving nothing but popcorn as her gift and threw the bag away. Thankfully it was still in the garbage when the gag was finally explained to her the next day. One year for Christmas, I gave my son-in-law a picture of me in a really glitzy frame…….on the back of it, I taped his Christmas money. I have also put money between the wrapped PopTarts in the Pop-Tart box. Another year I put money mixed in with the pages of a book. Money is a very practical gift, but I just always have thought it not very personal. Thinking of different methods of delivery, makes it a little more fun and shows some thought. I have riled money inside a toilet paper roll with a slit in it with a pull tab and wrapped in wrapping paper. 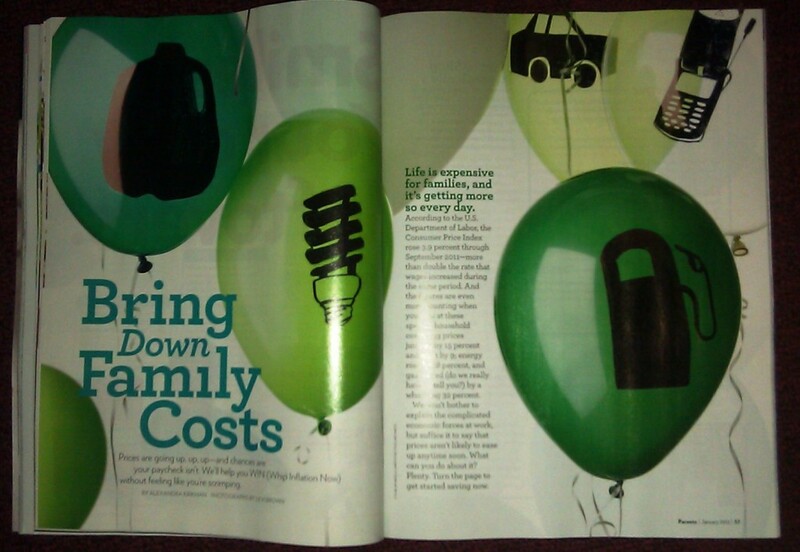 I also read a blog the other day that suggested sticking money in balloons and blowing them up and placing in a box. You can even mail it pretty cheap because it’s so light. I gave a gift of $250.00 mostly in one dollar bills that I taped together. I folded it back to look like a stack of cash and tied a ribbon around the stack. Then told them to untie and then they realize its taped together and when held end to end is about 25feet long. What type of tape did you use? This is a really cute idea but I would be afraid of the tape ripping the money when they pulled it off. Invisible Scotch tape works well and pulls off easily. I have used rubber cement to slightly overlap the bills and place a very small bead of rubber cement on the overlap. i’ve done this and regular scotch tape pulls off the currency, no problem. Every year for Christmas we play a Swap game and cash is always a favorite. The one that sticks the most was a few bills rolled up in the holes of a brick and then wrap the brick they think they’re getting a really heavy gift. I made oragami shirt and pants out of $20.00 bills. There are lost website with easy instructions. One Christmas morning, I told my daughter, “I’m sorry we weren’t able to get you much this year but money doesn’t grow on trees, y’know? Or DOES it?? ?” I then looked pointedly at the tree. She followed my gaze and there it was! Money “growing” on the Christmas tree! I’d rolled up the bills, all different denominations, into tiny rolls and tied them with ribbon. I used to ribbon to hang them on the branches. She didn’t notice the money hanging there at all until the hint. She had fun finding all the money on the tree. One year I made the kids a CD and all the songs had something to do with money in the title. The cover had all the songs listed and when you opened the CD, the check was inside. Another year, my husband and I took our picture with our hands up like we were holding a big check (like the lottery winners). We printed the picture large enough to put in an 8 X 10 frame and put their check in so it looked like we were holding it. Sue – I LOVE that lottery check idea!! After seeing last year’s Christmas gift from me in a box to go to Goodwill with the package unopened, I thought I might not give my niece’s stepdaughter a gift this year. But after reading the walnut idea, I am excited to annoy the crap out of her by making her work for a gift I know she will appreciate. So much fun.I love it,I love it. Thanks! When I was a teenager, my parents got me a big vase for Christmas. Then they put a new watch in the bottom and crumpled up dollar bills to fill it up. I had to pull out handfuls of money to reach the gift at the bottom. It was so cool! Neat idea! Thanks for sharing it! I give my teenage grandson cash for Christmas every year. One year I got $2.00 dollar bills and layed them one over the other like a fan and taped them together like that. He got several fans. Another year I went to the bank and got a strap of brand new-uncirculated $1.00 dollar bills. He thought the fact that it came straight from the mint was awesome. Another year, I took a calandar and picked random days and slit the lines between dates (like between the 5th and 6th, and then also between 6th and 7th) then I folded the dollar bill so that I could slide it thru both slits so when he flipped to that month he saw the face center of the money instead of the square where the 6 is supposed to be. Last year I got a box of millionaires and carefully opened the clear wrapper, then put the cash inside the box, then rewrapped the clear wrapper. 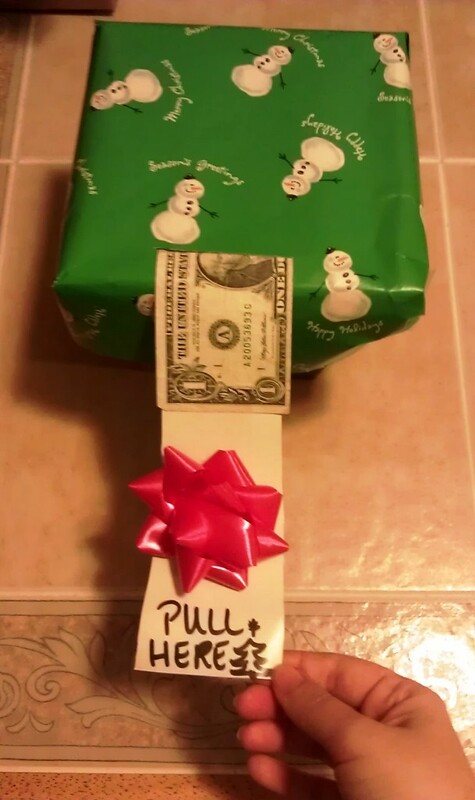 Last year I took clothing gift boxes, spray painted them black and made ATMs from the “Bank of Mom and Dad”, taped and rolled bills of different denominations, put them inside the box, cut a slot wide enough for the bills, then attached a note at the end of the money (sticking out of the slot) that said “pull here to retrieve cash”. It was an absolute hit with my adult kids!